In Vietnam, referring to vegetarian food, it cannot fail to mention to Hue that owns the most vegetarian dishes, even cooking Hue vegetarian has become an art. Vegetarian diet prevailed from the Ly - Tran dynasty to the reign of Lord Nguyen Phuc Chu (1691-1725). Therefore, Hue became the capital of Buddhism, the vegetarian customs also started to be popular in Hue in the aristocracy at the same time. Until now, Hue people from aristocrats and commoners have vegetarian tradition in order to get the pure soul. If you have the chance to visit Hue in festivals, to local temples, you can enjoy vegetarian meals that temples often prepare for their Buddhist. Hue vegetarian feast is relatively simple including soybean sauce, salt, vegetables ... All are planted by monks and Buddhist right plant in the temple garden. Although vegetarian meals are simple and frugal, they always attract a lot of people. Hue people not only take a vegetarian on the full moon day, the first day of the lunar calendar or holiday but they also eat vegetarianism. It seems that throughout the year, Vegetarian foods regularly appear in the meals of Hue families. And on the fourteenth day of the lunar month and the Buddha's birthday, most of Hue beef noodle shops sell vegetarian noodles. In Hue, most families themselves cook vegetarian dishes for dinner. Frugal vegetarian meal is also a way to express affection and sincerity of Hue people to their friends. This is a unique culture feature that perhaps you can only find in Hue. 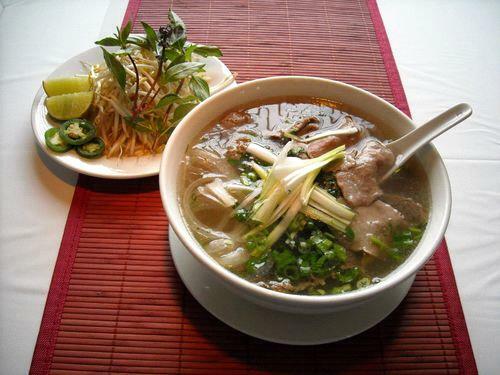 Meals on Tet holiday and Hue Festival are usually vegetarian feast. Until now, although there have been many changes, vegetarian dishes are indispensable dishes in New Year feast of Hue. Coming to Hue, tourists will have the chance to enjoy vegetarian cuisine in Hue including vegetarian rice, vegetarian noodles, vegetarian chicken, vegetarian fish, etc. Fruits, beans, vegetable oil are turned into eye-catching and attractive immensely dishes in a very short moment. A variety of ambrosias from spring rolls, exotic delicacies, lean pork paste, chicken meat to lobster, fried fish look extremely beautiful but are made from plants. Especially once enjoyed, people still think that they are real meat. It is made from the skillful housewifely hands of Hue people. The harmonious combination of vegetables, legumes and fruits cooked by vegetable oil, soy sauce, or salad, sour star fruit, pickled onions, banana flower salad, etc. decorated on the table is very interested. The dishes are put on a small plates making diners feel fragrant desire to eat some more. Appetizer for a vegetarian feast in Hue usually is carrots, papaya cleverly trimmed to decorate around roll plates. Bamboo crab soup is cooked from young corns, mushrooms, lotus seeds. And of course, it is indispensable rice and sticky rice. Not only that, you can also enjoy Banh beo (water fern cake), banh nam (steamed flat rice dumpling with pork and shrimp), banh bot loc (clear shrimp and pork dumpling), banh ram it (fried glutinous sticky rice dumpling), banh khoai (savory fried pancake), banh canh (tapioca noodle) with vegetarian filling.